When she was a girl, Yaoxing Chen’s parents noticed that she didn’t often speak in public and never spoke in front of strangers. As a remedy, they bought a bundle of newspapers and told her to sell them to people walking by on their street. “Sometimes we need external forces to push us forward, and my parents are that force,” she says. Chen’s shyness gradually fell away and she credits that moment with helping her overcome obstacles later in life. She figures that if a she could do that as a shy little girl, she can do much more now as an adult. That mindset helped her make the leap to studying at Drexel LeBow. She applied to the MS in Accounting program after earning her undergraduate degree in French, a move that required a complete “change of gears” in her thinking. And upon arrival in the United States, she found that her study habits had to be intensified as she adapted to American culture and played catch up with peers who already had backgrounds in business. Although accounting presented all new concepts, Chen found that some of her French language education was helpful. “The French language is very sophisticated, and [French and accounting] are comparable because you need to pay attention to every detail and really be precise,” she explains. Learning a new discipline required many late nights, but she says the hardworking and innovative spirit of the United States is what she was initially drawn to. “I feel that this country has values like the ones I grew up with. I feel tired, but very happy,” she says. 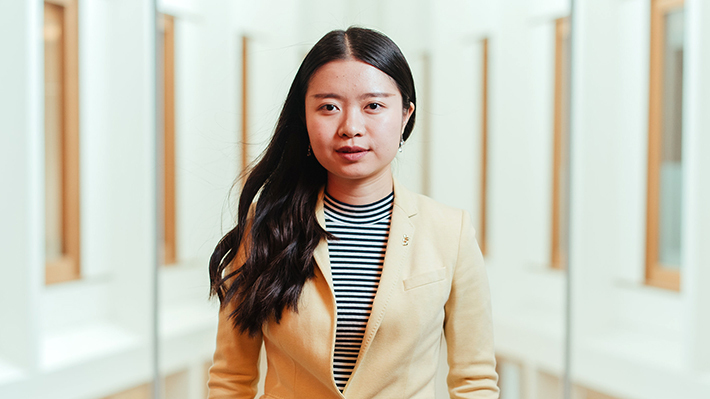 After a brief break following graduation, Chen will return to China and join Norinco International as an international financial accountant. The state-run firm works on the One Belt, One Road project that seeks to develop transportation and energy infrastructure in Africa and the Middle East. It’s an exciting international project, and Chen is eager to take on yet another new challenge. WDrexel LeBow’s MS in Accounting will prepare you to become a professional accountant or CPA. Apply for our Master’s in Accounting today and get prepared for the CPA exam.